The Cellular Scale: Can you turn a rat gay? What does it take to 'turn a rat gay'? This question may have crossed your mind, but a group in Mexico actually did the experiments to test it. Triana-Del Rio et al., 2011 used a co-habitation conditioning paradigm to see if they could condition a male rat to prefer a male partner. The basic paradigm was to house the 'experimental rat' to the 'stimulus rat' (who was scented with almond) for a full day every 4 days. Under these conditions, the experimental rat did not show any preference for the almond-scented stimulus rat later on. 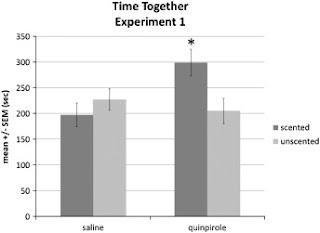 However, if the experimental rat was injected with quinpirole, which stimulates dopamine D2 receptors, he did develop a preference for the almond-scented rat. This preference was not sexual in nature. Preference was measured by time spent together, and these guys just wanted to hang out. So what does this mean? First of all, even the most drastic change was not permanent, partner preference dissipated after 45 days. And as I mentioned in my SfN summary, this protocol did not have the same effect in female rats. I do not think that the researchers here 'turned a rat gay.' While they did succeed in biasing the preference of the experimental rat for the guy he was housed with, they certainly didn't change the rats sexual preference in a deep or universal way. There is no evidence that the experimental rat preferred males in general over females, just that he really likes the one guy he was hanging out with. So this study does not really tell us anything about the biological basis of homosexuality, and it certainly does not tell us how to make a gay bomb. The most interesting implication for this study is in the activity of the D2 dopamine receptor, which may be involved in pair-bonding. I would be interested to see what some ex vivo cellular studies revealed about this treatment. Does quinpirole application cause a change in the number or location of the D2 dopamine receptors or the activity of the neuron? since then i've wondered if there's such a thing as a "sociological disease"
though "disease" is the wrong word - perhaps: "sociological behavior aberrations"
or even "sociological behavior variations"
Interesting; thanks for the post! This reminds me of the nature vs. nurture experiment. I do not think however you can turn something gay by exposing them to certain elements, however I may be wrong. Question.. is it a stuffed rat? can i borrow the pic for a forum? I am not sure if it is stuffed or living. I included the link where I found the picture in the caption. Click on "source"
i feel this study could have been done better. attempting to condition a male rat to be into anthoer male rat because of his almond scent. 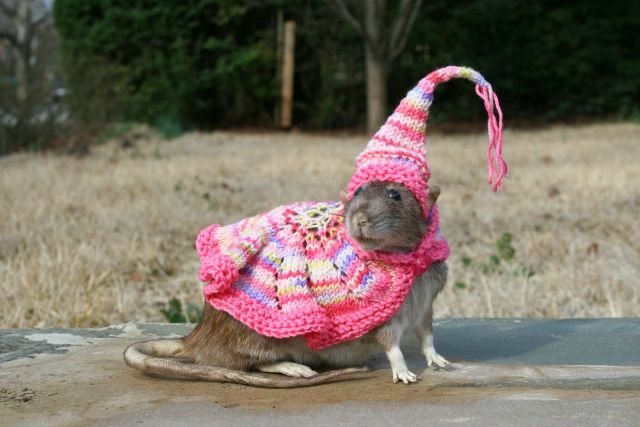 from this investigation there is not any conclusive evidence that a rat can be conditioned to be "gay".